The Cat Mod has been designed to fit studs spaced out either 16″ or 24″ on center. 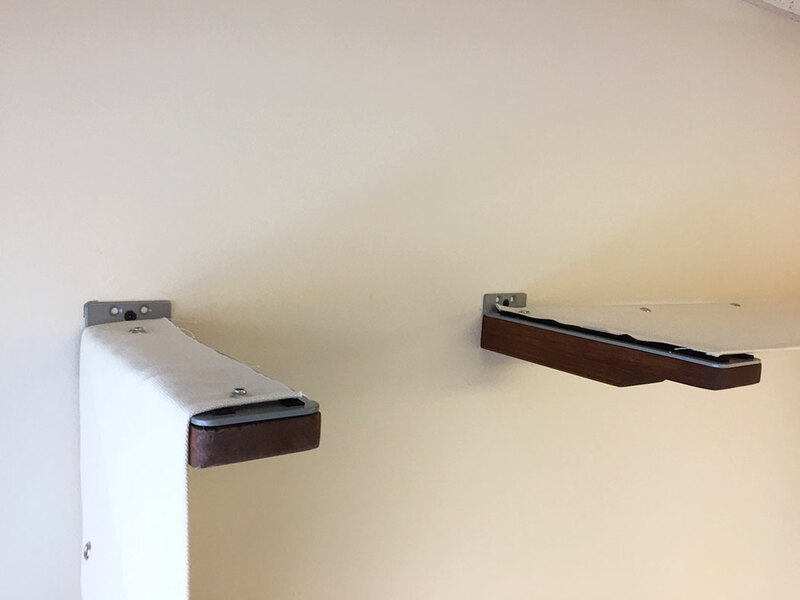 We encourage mounting each plank into studs. 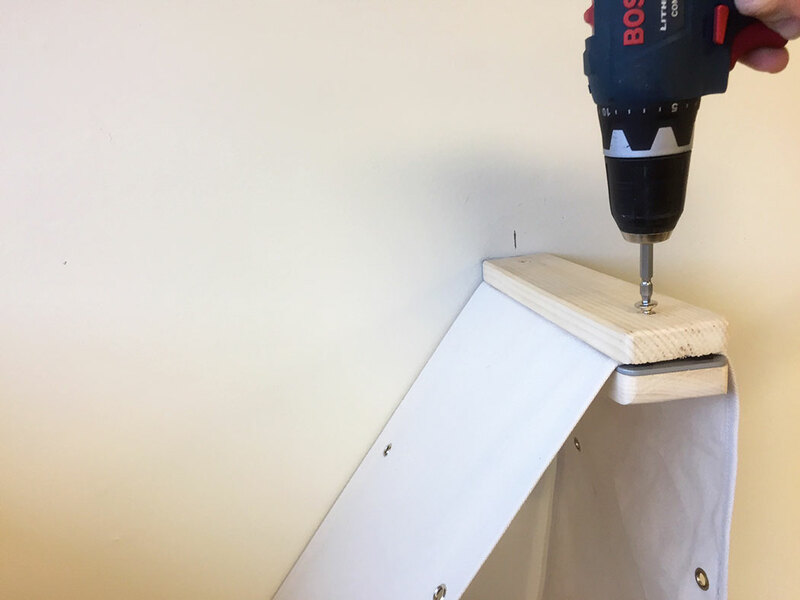 If you cannot find a stud where you want your piece to be mounted, you can also use 1/8″ toggle bolt anchors, found at your local hardware store. This collection was created with the concept that you will have the freedom to design your own layout. The following instructions can be used to mount any of The Cat Mod units. Each package will include a single strip of canvas fabric. 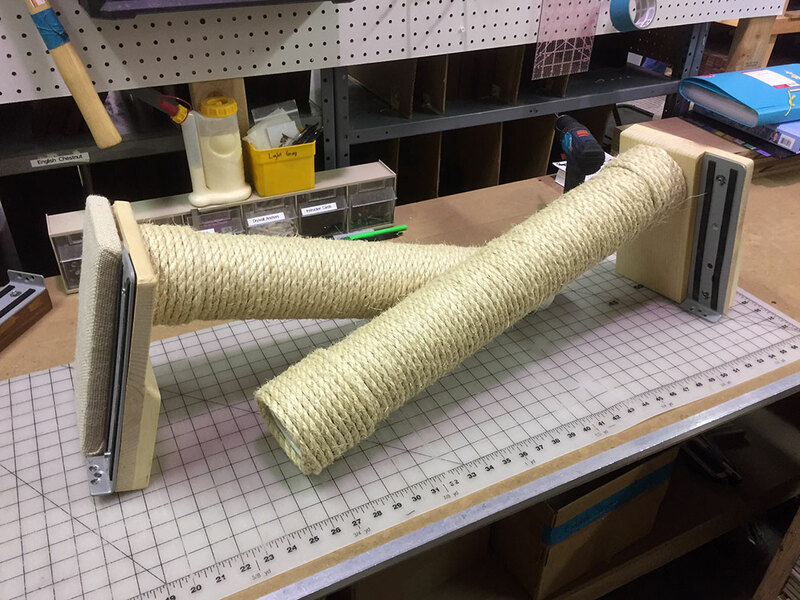 Our larger packages like the Play and Climb will need to be cut in a few places as you mount. 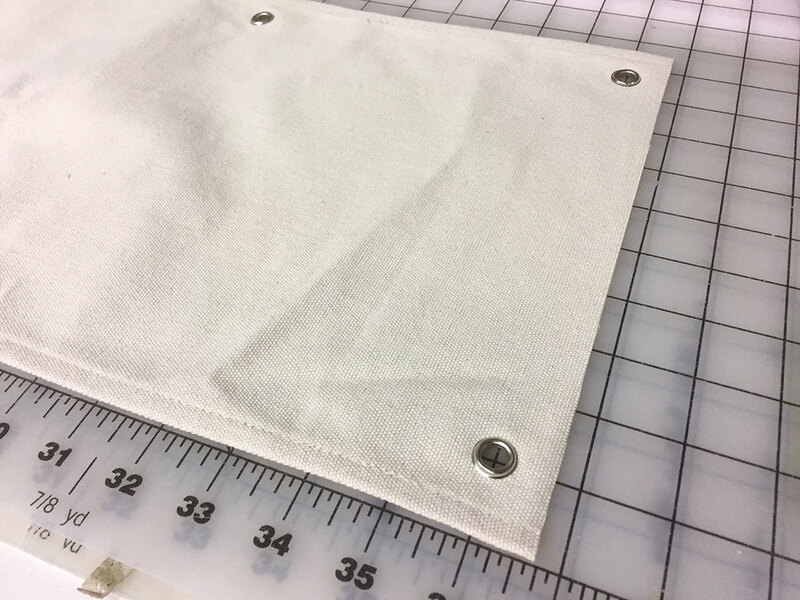 Whenever you need to cut the fabric, make it about 3/4″ from the center of the grommets. 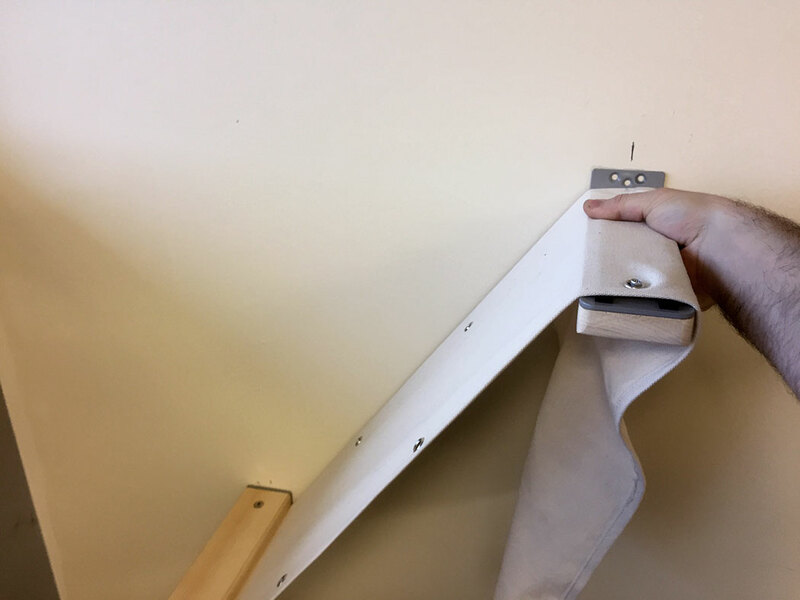 This length allows for the fabric to hold tight in each plank. If you’re using studs to mount your Cat Mod (which we highly suggest) then you first need to find and mark those. 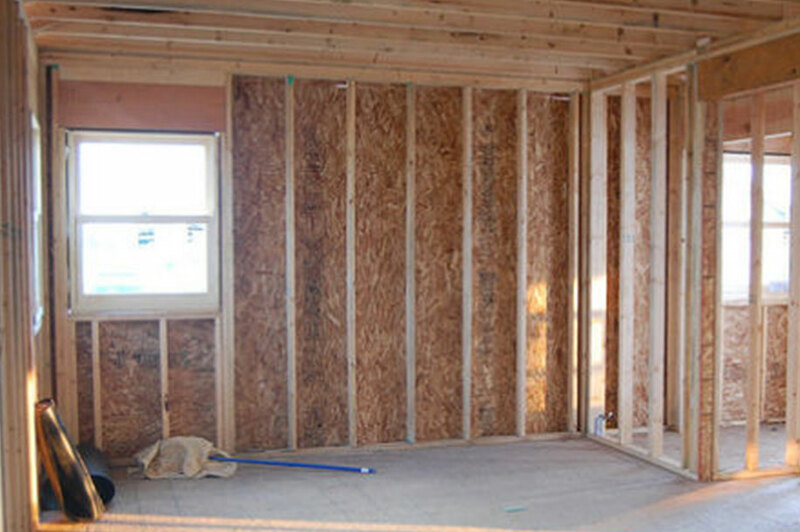 Studs are solid 2×4’s that sit behind drywall, shown in the picture to the right. Use a pencil to mark the center of each stud you are using. If you are mounting a complex like the Play or Climb we suggest marking a high and low point of each stud. 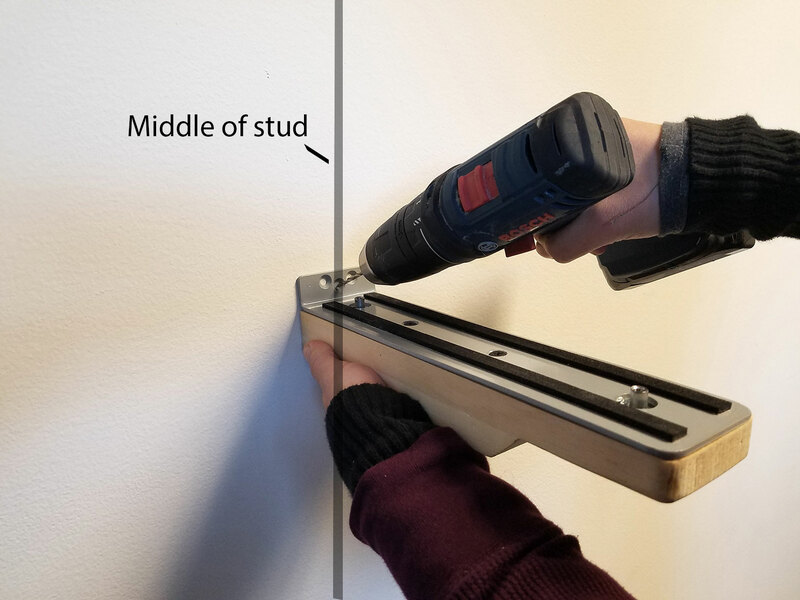 The easiest way to find your studs is with a stud finder. If you don’t have one, there’s a trick we found useful shown in this video. 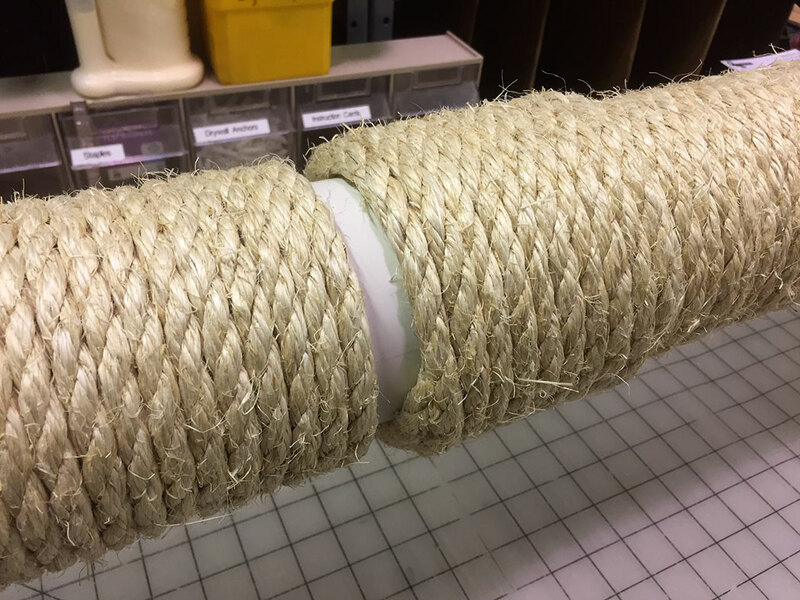 When mounting any package that includes a sisal pole, we suggest mounting this piece first and building out from there. If you have a package that doesn’t include a pole, start with the lower planks and build up. Be sure to keep the fabric sections pulled tight. Our cats wont walk on them at all if the fabric is loose. At this point, you should have already marked the middle of your studs (covered above). Using the hex-head bit, remove the two hex screws from the assembled planks. 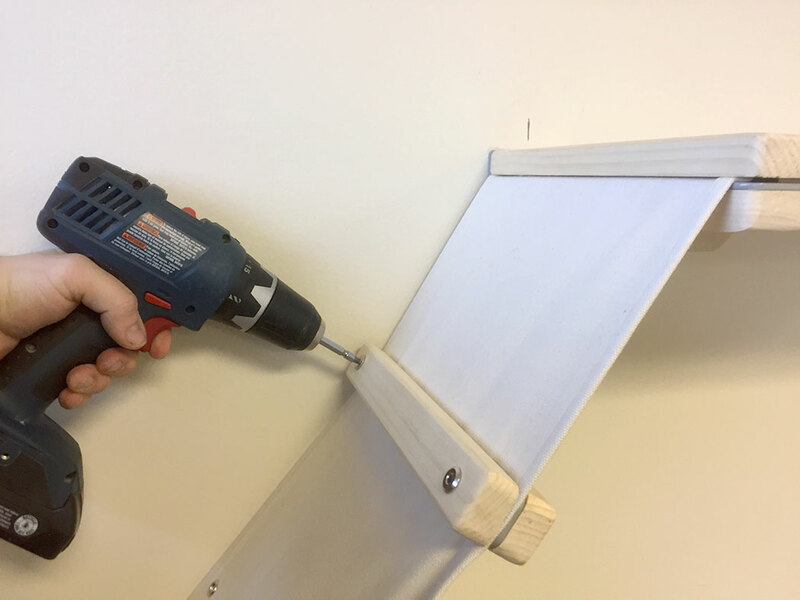 To mount the first plank, hold it against the wall in the middle of a stud with one hand and then use a power drill and ⅛” bit to pilot a hole through the center bracket hole into the middle of the marked stud. Starting from the middle stud will help you line up the rest of the planks. It also helps to angle the pilot hole down as shown to the left. 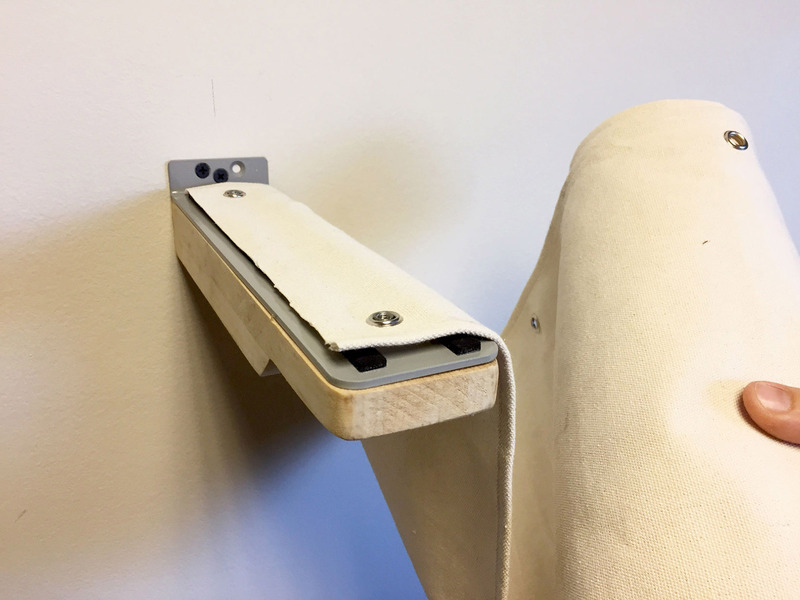 With studs, you only need to use two of the mounting holes. When we mounted everything, we started with the middle hole on each plank and then went with either the right or left hole. Lay fabric over the plank, lining up the two fabric grommets with the two posts. 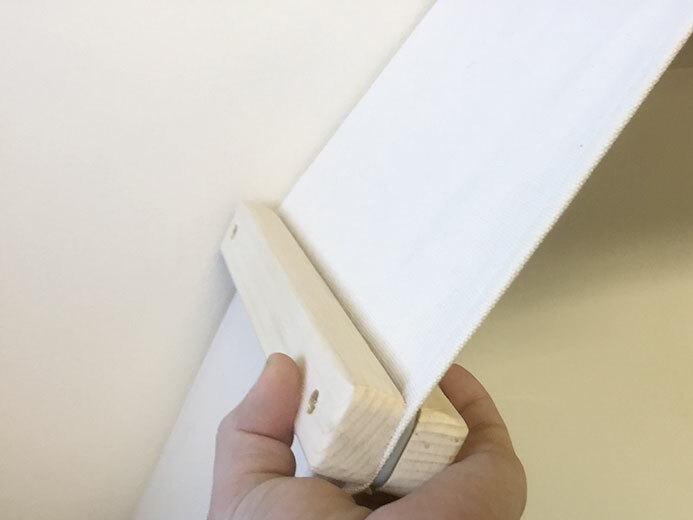 Put the wooden caps back on the planks and tighten the furniture screws until the canvas fabric is held firmly in place. Over-tightening will result in the screw sinking into the wooden plank. Be sure to tighten both screws, front and back. As you can see in the picture we positioned the fabric to continue to the left of the board. You can position the fabric to the left or right, depending on the direction of your next plank. The Escape Hatch is mounted onto two planks. It can be added to and continue a hammock structure or be mounted on its own. Start by removing the two hex screws from one side of the Escape Hatch, removing one of the planks. Mount this plank, centered on a stud. If you are adding onto a complex, you can simply remove the top of the plank to be used. 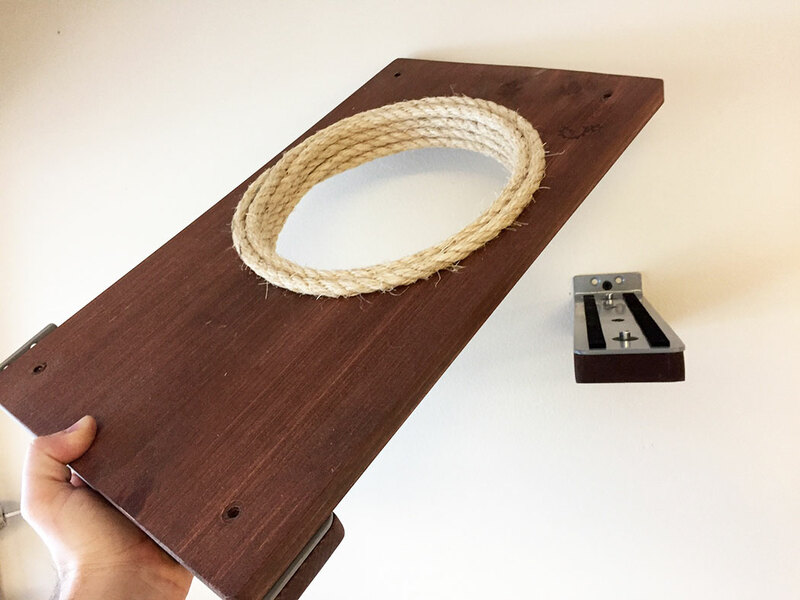 The Escape Hatch and second plank should be held up along the mounted plank. 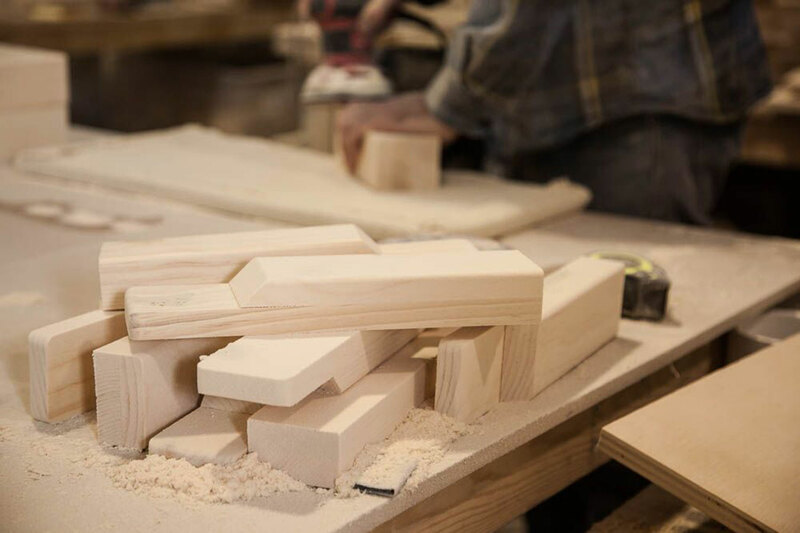 Be sure that each end of the shelf is lined up with each plank, as you’re using the shelf as a measuring device to find the correct position to mount the other plank. Place a level on the shelf and trace the corner of the unmounted plank. This mark will be used to mount the plank. 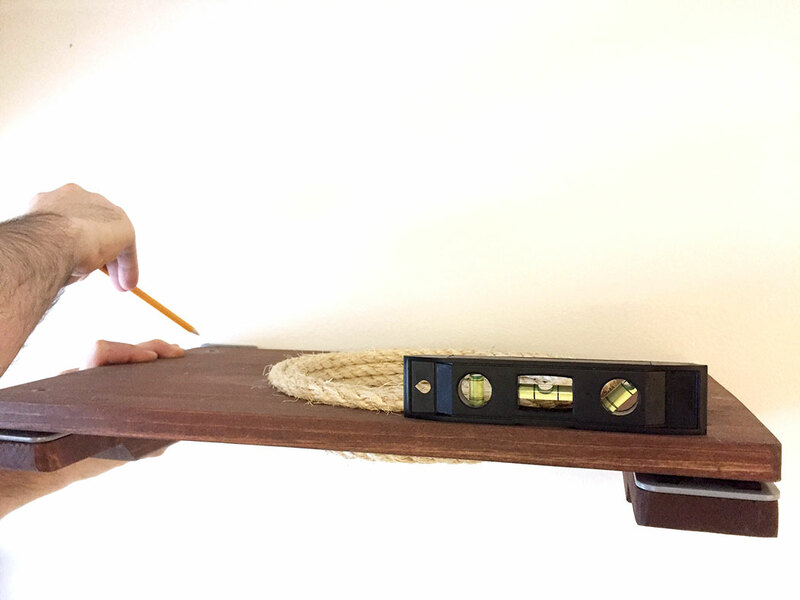 Take the shelf down from the wall and mount the second plank using the mark you made in the previous step. 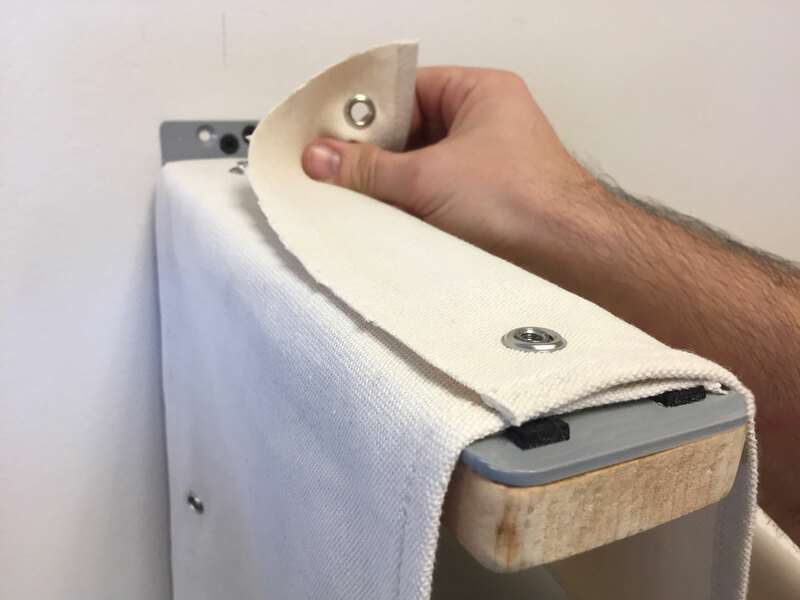 If your design includes fabric coming from either side of the shelf, lay it over the planks and attach the grommets to the posts. Place the shelf on top of the planks and use the furniture screws secure the unit. 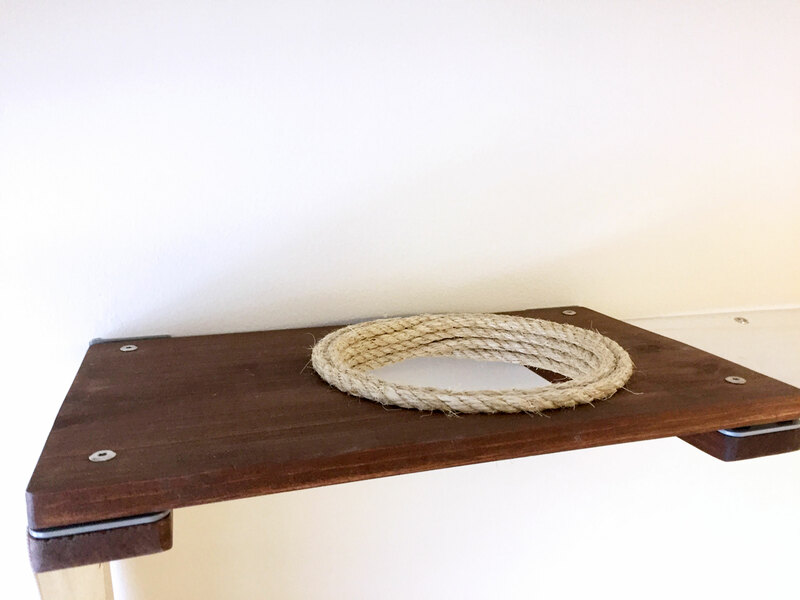 Keep in mind that the shelf can be mounted with the hole to the left or the right; this allows you to make it easier for your cat to jump through the hole. For reference, the Escape Hatch shown on the left has a hole on the right. This setup is beneficial when a cat is jumping from the bottom-right to top-left, as they have a landing atop the shelf. 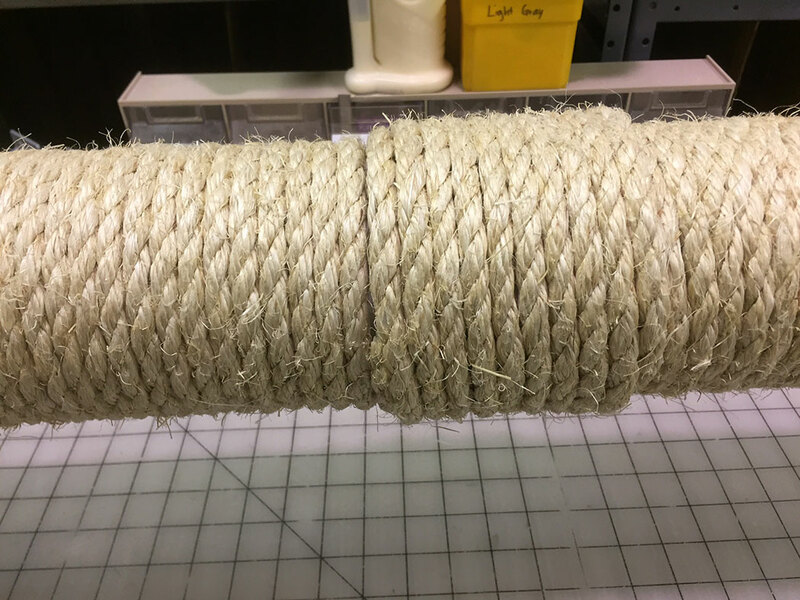 When building a complex that includes a vertical sisal pole, you will want to start with this piece. 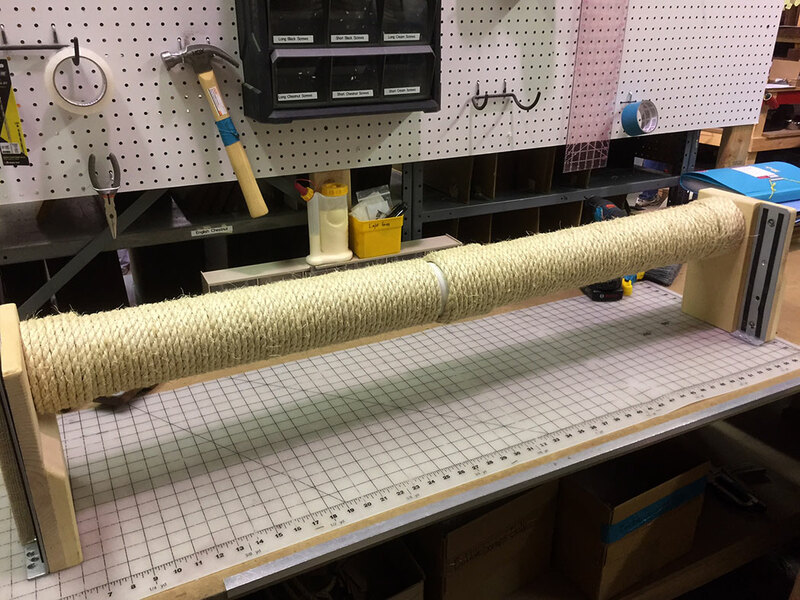 Cats prefer for the fabric to be stretched tight and it’s easier to get it tight when starting with the pole. The sisal poles come in two section. These two sections need to be attached before mounting. It helps to lay them on solid ground with the backs of the planks facing down. The backs should both be flat on the ground, to ensure that they will mount nicely to the wall. Push the two halves together so that you can no longer see any white plastic. 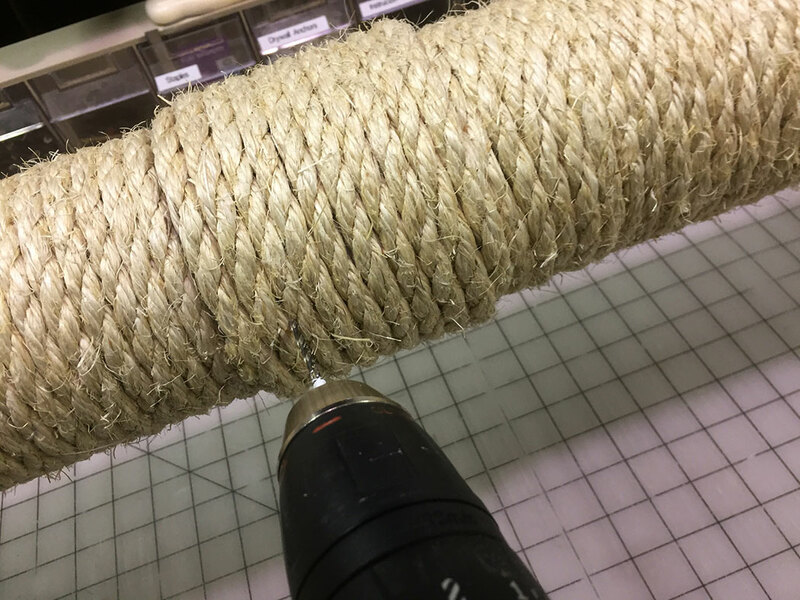 Next use the two tan screws to drill into the pole between the second and third rows of sisal at the end of the pole. push the two haves together so that you can no longer see any white plastic. These come with two screws to hold the halves in place. 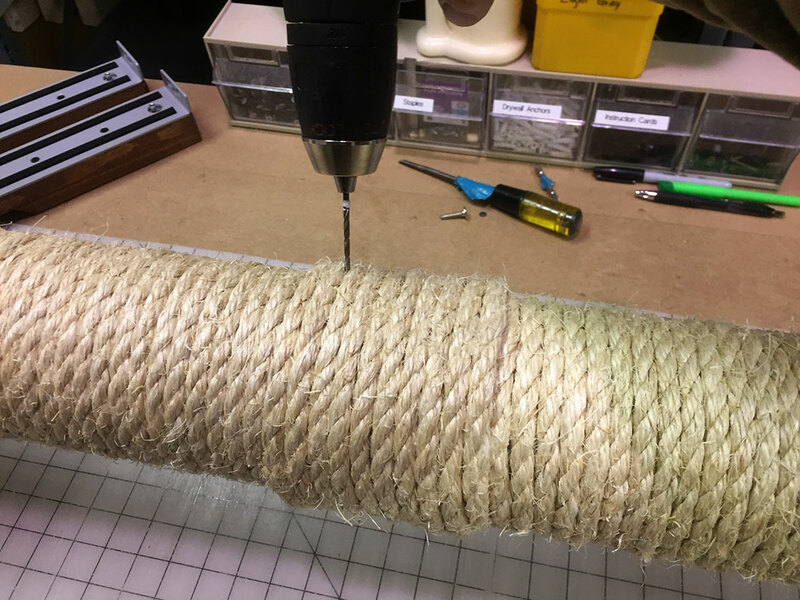 counting two rows of sisal from the end of where they fit together drill two holes and screw in the tan sisal pole screws to securely hole the two halves together. Make sure to pick two spots on opposite sides of the pole. This will create the most sturdy hold. Each pole needs to be mounted into a stud. Because this is a 4′ pole, it helps to mark the middle of the stud low and then again a few feet higher. 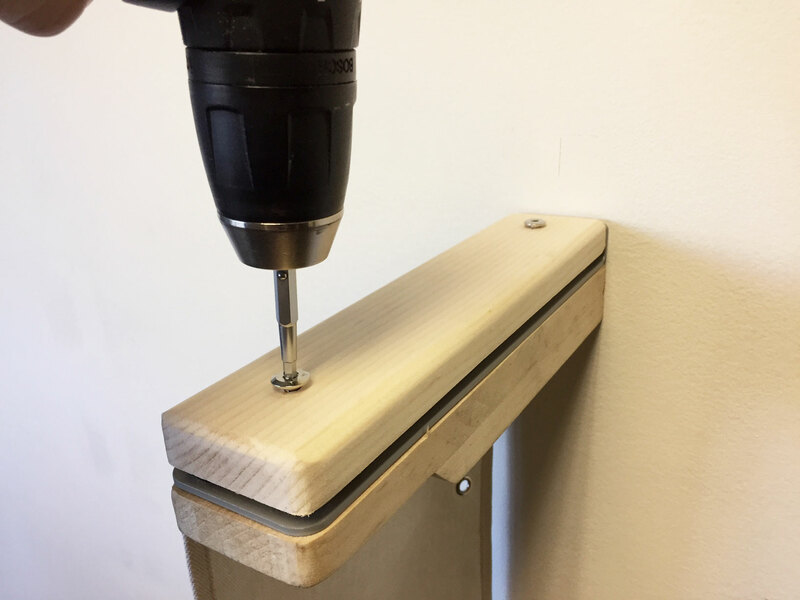 Next, expose the mounting bracket by removing the wooden caps on each of the mounting planks with the drill and hex-head bit. The final step is easiest to do with an extra person. Hold the sisal pole against the wall, lining up the middle bracket holes with the middle of the stud. 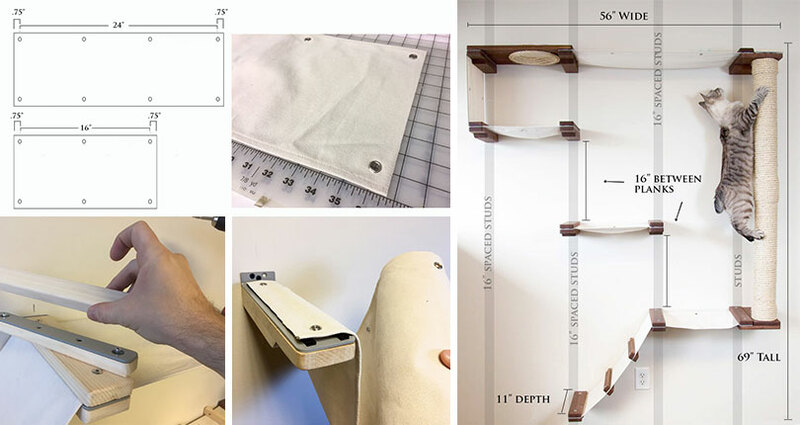 Use instructions for mounting individual planks which we covered previously on this page. Using the Hex-head bit, remove the tops of the planks. For the ladder, it’s easiest to start with the lowest plank and then work your way up. 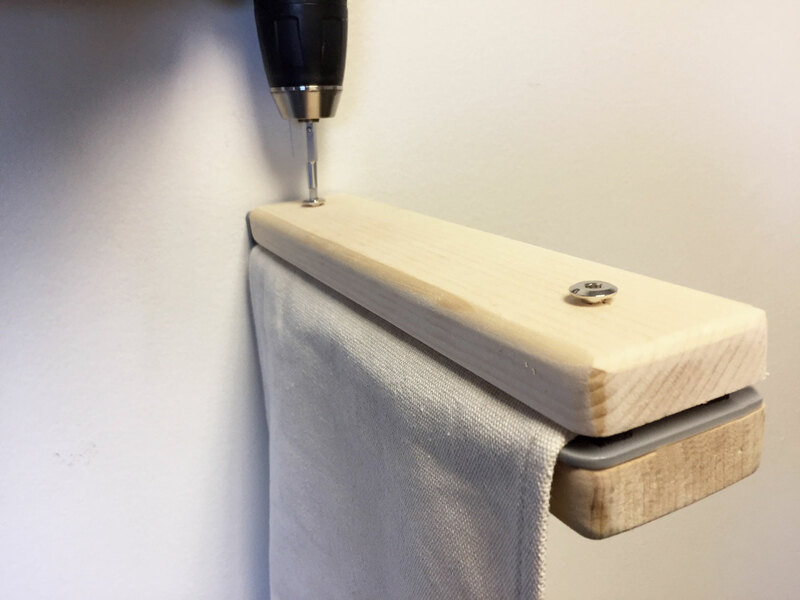 Mount your first plank, lining the middle mounting hole up with the center of the stud, drilling a pilot hole, and installing a long black screw. Then mount either the left or right mounting hole. Each plank only needs two screws. Next, lay the end of your fabric over the mounting planks, with the fabric continuing towards the direction of your next planks. Replace the top of the plank and install the furniture screws. Be sure not to over-tighten. If the screw starts to sink into the wood then you are going too tight. If it sinks a little that’s fine, but to keep your tops undamaged it’s nice to just tighten and stop right before the screw starts to sink. 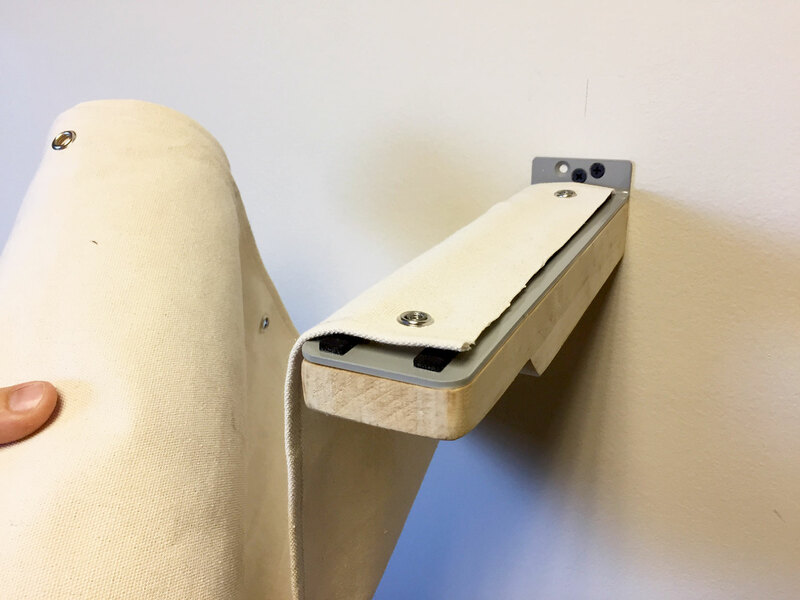 Next, if you have 16″ studs (which is what our pictures show), place your next plank’s mounting posts through the 3rd set of grommets away from the first plank you mounted (fourth plank if you have 24″ studs). 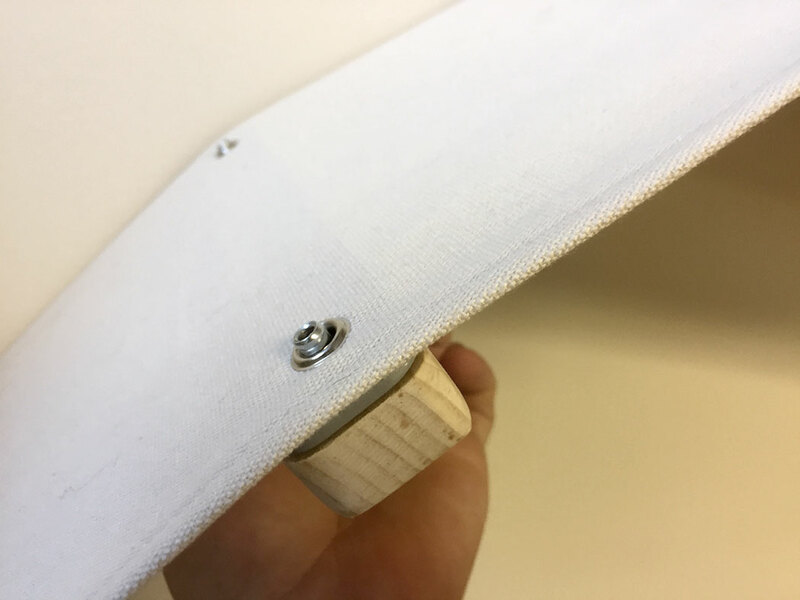 Hold the fabric to the plank and pull the fabric tight, lining the middle hole of the bracket up with the center of the stud. 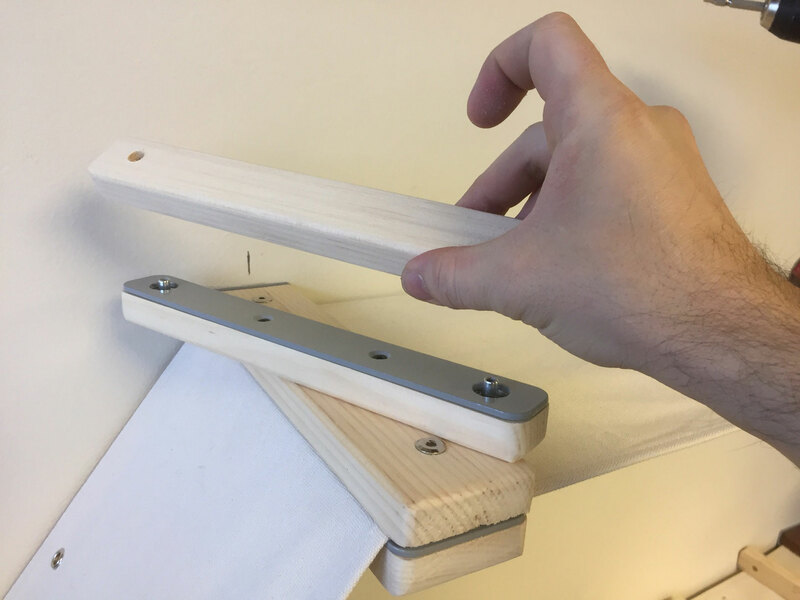 Mark that bracket’s placement with a pencil and mount the bracket with the same procedure you used with the first plank. Pull the fabric over the mounted plank and attach the wooden top to securely hold the fabric in place. 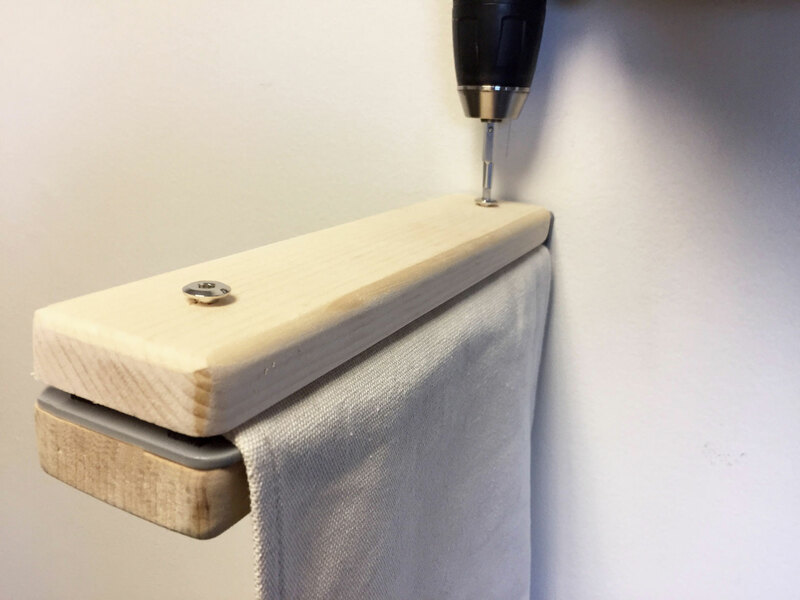 Screw wooden top in place using the furniture screws to securely hold fabric in place. Remove wooden top from each of your ladder steps. Then place the mounting posts through the sets of grommets. Then screw to secure step.